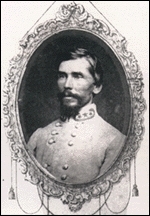 For, noble Cleburne, thou art one this world will ne'er forget. Until they ope in Paradise, with clearer, heavenlier light. For thou art in the angel world, beyond the starry skies. A glory wreath, not of the earth, but made by hands divine. A chieftain here on earth is lost, in heaven an angel found. A nobler for the South ne'er died, a braver never bled. A last farewell--how can we speak the bitter word farewell! The anguish of our bleeding hearts vain words may never tell.